The “Mail” program in iOS is a very good email client. I’m using it to write and read emails from my Gmail account. By default, when you are using Gmail in the Mail program, you can only archive the emails. This is not that convenience for me, as for me, most of the time I need to delete the read emails. When you have enable the “Delete” button for Gmail in Mail, when you swipe the email line in your email box, it will show “Delete” button instead of “Archive” button. 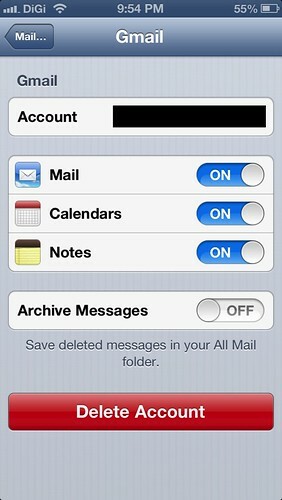 Press on “Mail, Contacts, Calendars”. Then choose your Gmail account. At the “Archive Messages” option, press the option to turn off.